When most people think of the Matterhorn mountain they think of Zermatt, Switzerland ‘the most photographed mountain in the world’ but did you know that the Matterhorn is situated in both Switzerland (Canton of Valais) and Italy ( Aosta Valley ). 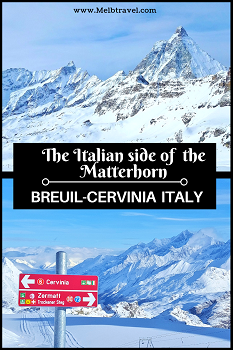 Not only this but the Italians have their own resort called Breuil-Cervinia Ski Resort and know the Matterhorn Mountain as Monte Cervino. 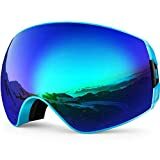 I have skied in some beautiful places around the world but Breuil-Cervinia Ski Resort is one of the most stunning ski resorts that I have skied in. 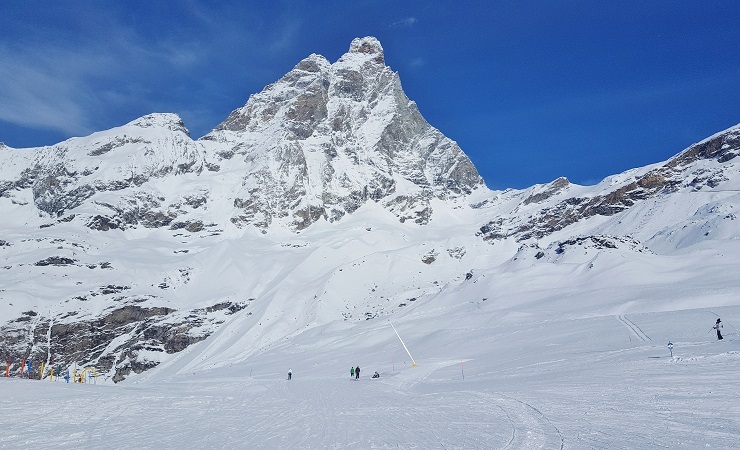 At an altitude of 2,050m, Breuil-Cervinia Ski Resort is one of the highest resorts in Europe and it literally feels like you are on the Matterhorn (cervino) as soon as you come out of your accommodation and start skiing. There is so much going for this resort from ski in and out accommodation to having one of the longest ski seasons in Europe, from October to late May with guaranteed snow. I cannot fault this resort in any way, instead, all I can do is tell you about all the reasons why you should go there. 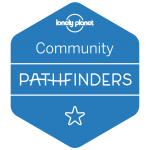 Combined with the Valtournenche and Zermatt ski areas, you have over 300 klms of groomed ski runs and they are looking to expand this within the next couple of years. They already say that if you ski continuously for 4hrs every day for 6 days that you would not do the same run twice. If the new gondola goes through it will make it the biggest ski area in Europe. Breuil-Cervinia Ski Resort is located in Italy’s Aosta Valley, one of the highest resorts in the Alps. 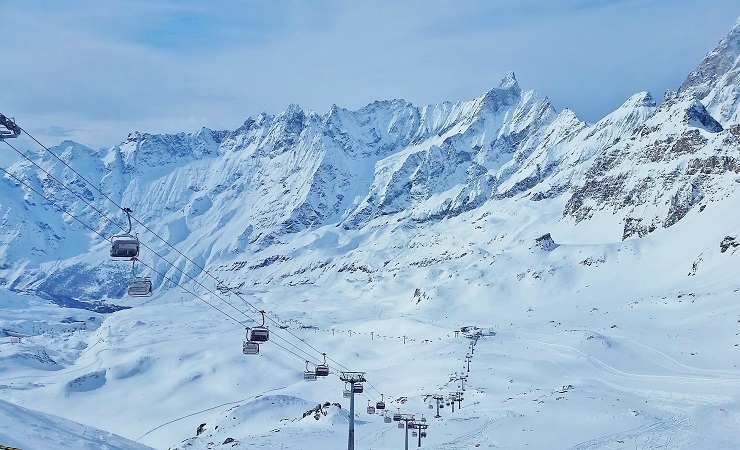 It’s high-altitude ski area links with both Valtournenche and Zermatt in Switzerland, offering over 300klms of groomed runs and guaranteed snow during the ski season. Lift systems: 19 in Breuil-Cervinia/Valtournenche (combined) + 34 in Zermatt. 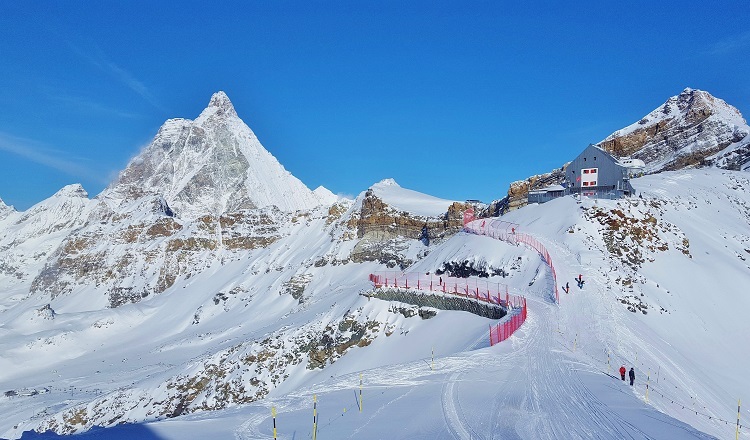 Groomed Ski runs: 72 in Breuil-Cervinia/Valtournenche (combined) + 78 in Zermatt. 3 Snowparks. Please note though that you CANNOT use the Snowpark without wearing a helmet! Do the famous number 7 slope from the top to the bottom, where it ends in the Breuil area. It has some of the most amazing views, especially of the Matterhorn (Cervino). So make sure you have your camera ready. This is a great resort for families with children to enjoy together, especially while learning. A lot of blue & red runs are wide and in gullies, which makes a great place for children to learn and not to be scared of going over the edge. A few of the chairlifts have child proof locks so they won’t fall out, which would be a great piece of mind for any parent. 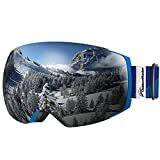 There are also other activities off the slopes for children like Ice-skating and is FREE if you hold a ski pass for more than 3 consecutive days. 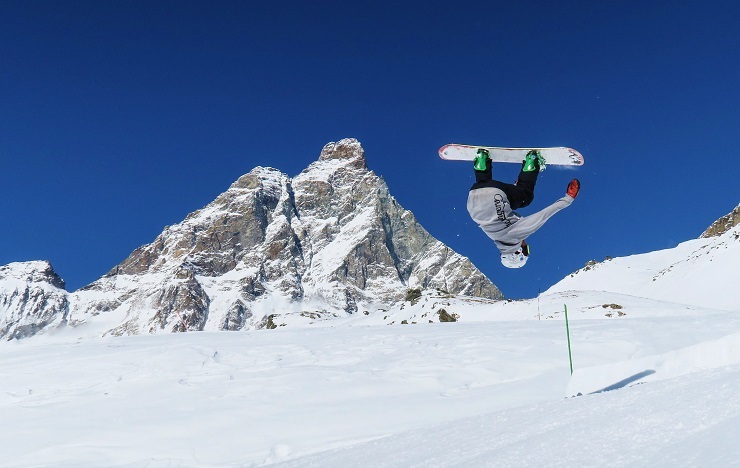 Breuil-Cervinia/Valtournenche offers various promotions and discounts during the ski season. 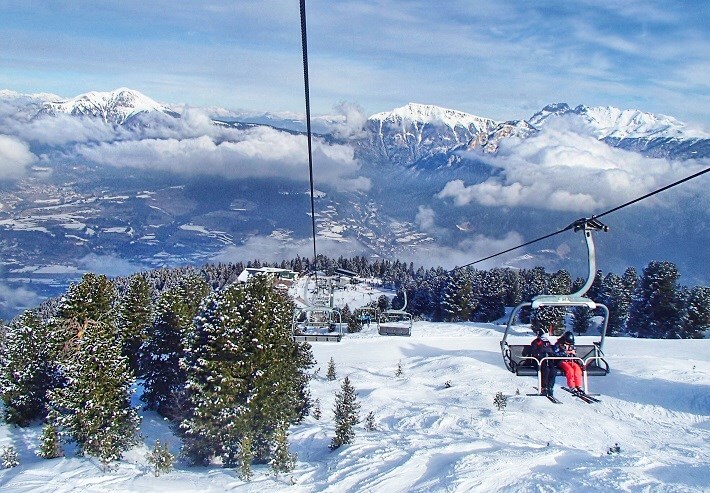 They allow you the flexibility to use a ski pass for a couple of hours, half days or over consecutive days. 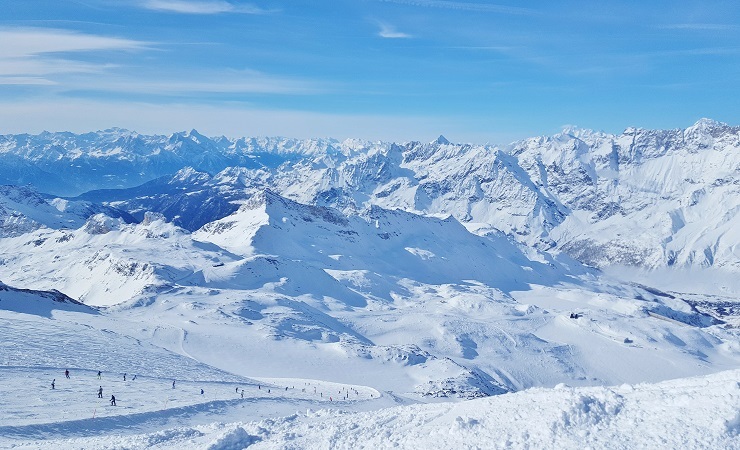 You can get a ski pass just for the Breuil-Cervinia / Valtournenche ski area or an international pass for Breuil-Cervinia/Valtournenche and Zermatt. Buy your ski pass online to miss the queue and pick it up from the ski office. The closest international airport is Turin Airport (also known as Torino), which is an hour & half drive away. Both the Geneva and Milan Malpensa airports are also alternative arrival points but you will need to add an extra hour driving. There are no direct trains to the resort and the public bus does not run every day. The best way to get to the resort is by private transfer, shared transfer or hire a car We hired a car for our 4 days, which was cheaper than a private transfer going just one way. There a lot of car rental companies available from the airport, so I would suggest booking one online beforehand to get the best price. 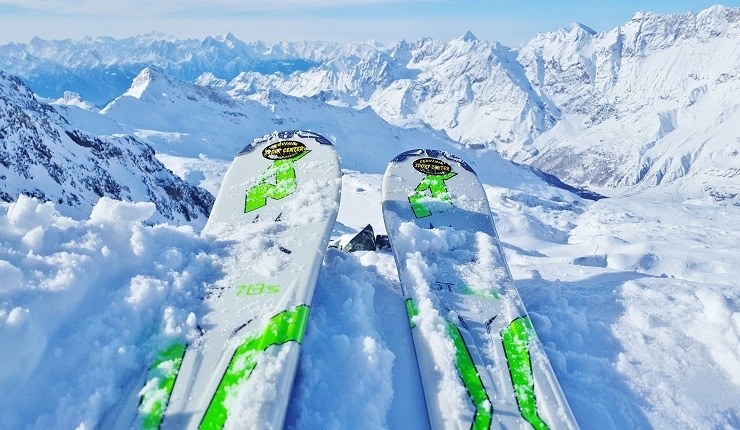 We hired our skis from Sports Centre in the middle of Cervinia Village, which was recommended to us. We also received a discount with our ‘Winter Card’ (refer to the tips for more info), which is around 10%-15% off your rental. The staff were really friendly and the skis were of high standard. Beware though if you are skiing half a day during the week the shop closes for 2hrs over lunchtime for a Siesta (most of the Cervinia Village is closed), so you will need to get your skis back before 12.30pm. If it is going to be later, I would suggest talking to the shop. Breuil-Cervinia Ski Resort has an exceptional range of accommodation available, from basic apartments to luxury hotels with spas and swimming pools. The best bit is that most of the accommodation is either within walking distance to a chairlift or they are ski in-ski out hotels (something I definitely love). We stayed at the beautiful 4-star family run Hotel Excelsior Planet right across the road from the ski slopes and with views of the Matterhorn. This place had everything you need for a holiday, warm hospitality, a four-course dinner mixed between traditional Valle d’Aosta and Italian gastronomy and a Wellness area to relax in the afternoon. 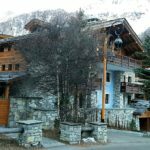 Accommodation is also available in the nearby village of Valtournenche, which is a little cheaper option and is connected by the chairlifts and gondola. This is not an additional cost, as Valtournenche is part of your ski pass. 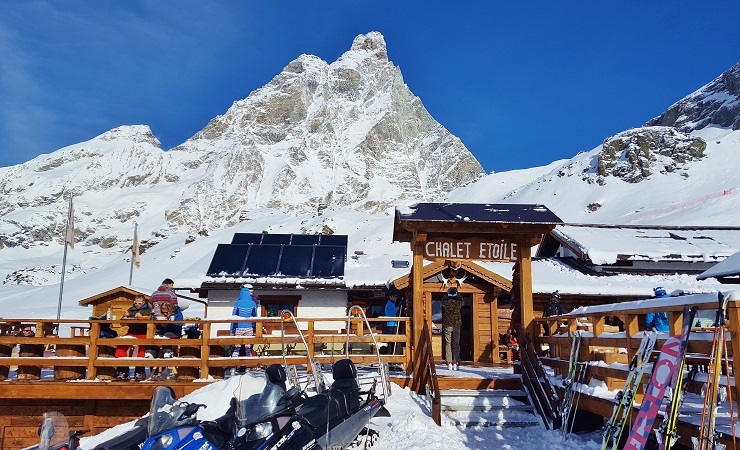 Chalet Etoile is renowned for making some of the best food on the Breuil-Cervinia Ski Resort slopes, which has made them very popular over the years. You will have to book in advance during the peak period to get a table for lunch. Even skiers from Zermatt, Switzerland ski over to have lunch here for the day. It is also a great spot to stop for a drink with the Matterhorn (Cervino), as your backdrop and Breuil-Cervinia Ski Resort as your view. It is definitely one of those views that you have to see to believe. I usually do at least one (or maybe two/three) afternoon’s Apres ski but unfortunately, I was unwell when I was in Breuil-Cervinia Ski Resort (not the resorts fault), so I didn’t venture out. However, I did stop at a place called Bait Cretaz just above the Breuil-Cervinia Ski Resort Village on the blue run home for a few glasses of prosecco. It’s a cosy place with a small adjoining hotel run by a lovely Italian couple with a dog, who occasionally would come over for a pat. The bit I loved about this place and I found surreal was that they were also a sushi restaurant that delivered to your hotel. Now usually, I would be a little bit funny about these things but I tried the sushi and it was fresh and really nice. Catch the cable car from Laghi Cime Bianche to Plateau Rosa and stand on the yellow line, which is the border between Italy and Switzerland. Ski over to Schwarzsee on the Swiss side for lunch, if you are looking for some additional amazing shots of the Matterhorn Mountain (Monte Cervino). Do the ski run over to Zermatt for the day, if you have time and you are a moderate skier. It takes you around the Matterhorn (cervino) if you do the number 69 or 70 towards Zermatt village. Most of the run is red but to be honest, I didn’t find it too hard to do but this is my personal opinion. If you do decide to head over to Zermatt or vice versa make sure you get home before the last chairlift. Otherwise, it will end up costing you a small fortune to get back via a taxi (Cab) and will take around 4 hours one way. My understanding is that you are not allowed to use a drone on the ski slopes and in the ski area. 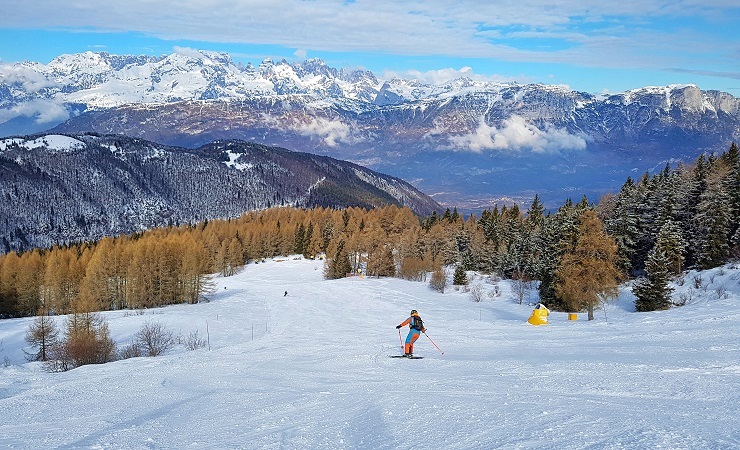 Thank you for reading this article ‘The Italian side of the Matterhorn, Breuil-Cervinia Ski Resort Italy’, I hope it helped you to decide where to go for your next ski trip. Breuil-Cervinia Ski Resort is definitely a great gem of a ski resort in Italy. 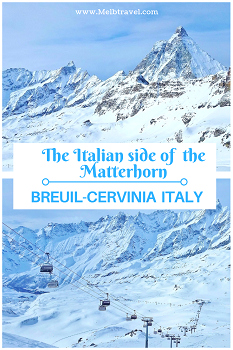 Have you been to Breuil-Cervinia Ski Resort Italy before? I would love to hear your experiences in the comments below. 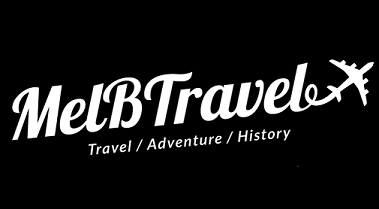 If you want to take a break from skiing and your Adventures or are staying in Turin for the day before or after your trip. Then there is plenty to do. Gorgeous ski runs! And so many runs to choose from. What a glorious ski destination. Thank you Jen, it is a beautiful place and I highly recommend it. Not only is the runs great but the food is pretty amazing too. Oh wow this place looks amazing. I never knew there was an Italian side, so good to know. On the bucketlist!!!! Thank you very much and glad I was able to inform you about Cervinia. I definitely recommend adding it to your list and please let me know if you ever go. 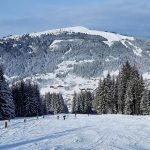 I love the sound of being able to ski out of a hotel straight onto the slopes – this place sounds perfect for some friends of mine, I’m going to get the m to check it out! I love love love this place and it is only an hour from the airport. I highly recommend it for your friends and drop me a line if you need anymore information. I’ll have to check this resort when we book our ski vacation for next year! Wide runs and hotels near the slopes is just what we need when skiing with kids. Thanks for sharing your experience and beautiful pictures. 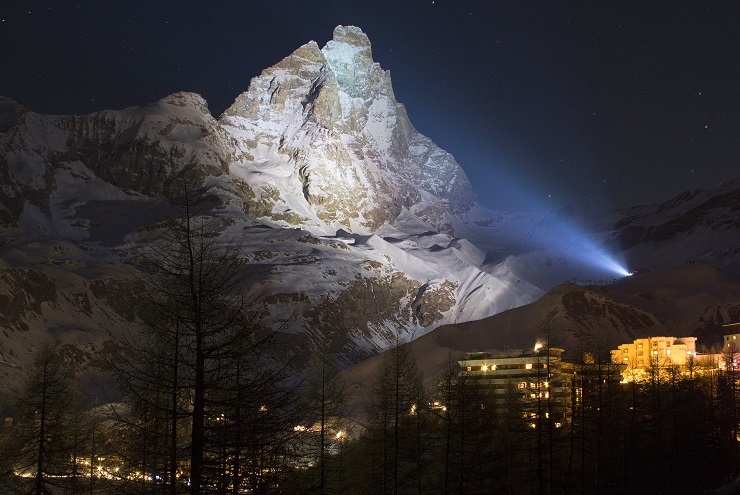 That picture of the Matterhorn lit at night is simply incredible! I had no idea that the Matterhorn mountain is situated both between Switzerland and Italy. I thought it was all Switzerland! I like that you tell me exactly which lift or line to ski down. Pinning this for later! To be honest, I never knew either until a few years ago when I was skiing in Zermatt and then I came across it. I love the place, it is like a hidden gem. I am one of those people who didn’t know the Matterhorn was partially in Italy. 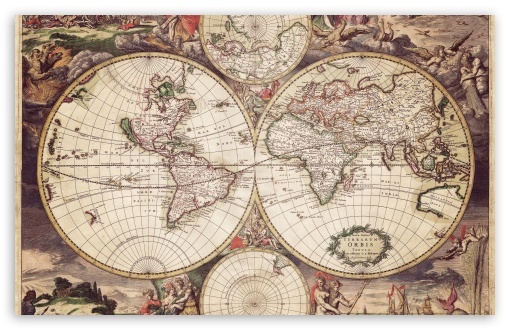 I guess I never looked at a map. Your photos are absolutely gorgeous! Funny how I can not know about a place, read a little, and be dying to go! And I’d try the sushi, too. O, how I wish I could go on more winter ski resort vacations. I can’t ski, but just the views itself makes me want to go to these ski resorts. I would love to go here someday ! Ski resorts these days are so developed that they cater for nonskiers especially if you have children. You are right the views along are gorgeous and it the one thing I never get sick of seeing. Whooooaaaaaa. 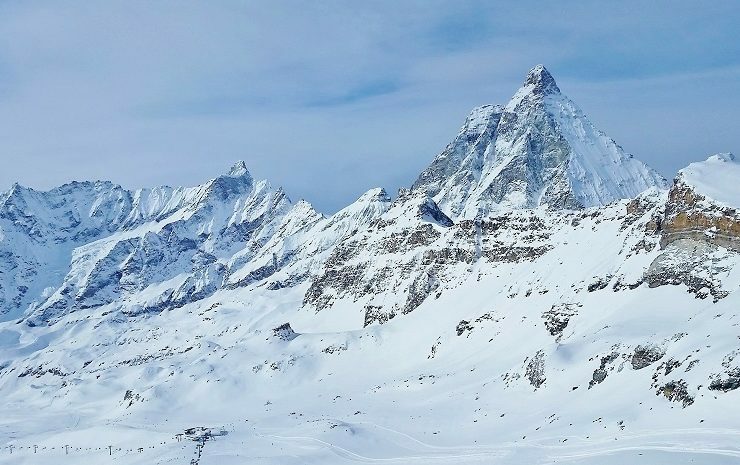 I am not a skiier but things I LOVE include: Italy, Switzerland, the Matterhorn, and good photography so I LOVE this post! I’d like to go here just to shoot it, even though I am not a big snow fan 🙂 Chalet Etoile looks and sounds like one of the most dreamy places on earth – what an experience! Thanks so much for sharing. Cervinia is definitely a photographers paradise for sure. There a lot of tourists that go there just for the day to take photos, as it is not that far away from major cities. I have seen photos of it in the summer and it looks just as stunning. I am not a skiing person, as I broke my leg on a ski slope!! I would love to go see the Matterhorn as it looks so beautiful. Maybe I can go in summer and do some hiking there instead. It looks like a stunning area. Sorry to hear about your broken leg. Apparently, it is just as stunning in the summer. The Matterhorn overwhelms one with its sheer majesty. Have been to Zermatt and hence have viewed the Matterhorn from the Swiss side only. Breuil Cervina looks like a Skiers paradise, would love to get there some day and view the Matterhorn up close from the other side. Loved your skiing action pics. The first time I saw the Matterhorn was when I was on the Swiss side to skiing. That is when I learnt about the Italian side and it does not disappoint. It is always only an hour from the airport. Wow it looks like a fantastic destination for a ski trip! It somehow reminds me of Whistler in Canada! I am not a skier, but I would love to visit just for the view! I never been to Whistler but I have heard so many good things about it and definitely high up on my bucketlist. A lot of people do visit for the day to just take pictures. I was just in Disneyland and one of my favorite rides is the Matterhorn bobsleds. I’ve been wishing to see the real thing in person. Wow, how majestic it looks! I lovvvve Disneyland and their Matterhorn was the first one I had seen but nothing beats seeing the real thing. It is huge and definitely majestic looking. So beautiful – it makes me miss the mountains seeing these beautiful photographs. It looks like an absolutely perfect place to go skiing in! Lots of long blue and red slopes would suit me totally! As would the apres ski!! It’s always funny to remember how close Switzerland and Italy are, given how incredibly different the two countries are from one another. It must be such a different experience on each side of the mountain! To be honest they are not that much different and apart from the prices in food and accommodation. They share the same ski area, so most people ski between the two countries. I’m so depressed!!! I still haven’t skied in my life so far. I really hope I’ll do it in future! Atleast fall in such a gorgeous landscape if not ski (as Dr. Leonard Hofstadter says to Penny! Lolz!). I was in Milan last summer. Sadly I couldn’t visit the places in winter! The border between Swiz & Italy is interesting! Milan is only 2hrs away from Cervinia 🙂 You don’t have to ski to go there, lots of people go to take pictures of the Matterhorn and to enjoy the food and wine 🙂 I highly recommend it!!!! Bloody hell, I can’t get over how beautiful it is! We are going to Zermatt in late May but if I had known you could do this I probably would have booked a ski trip instead, especially because flights to Milan from London are normally quite reasonable. 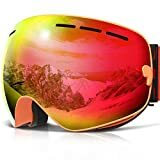 Maybe I’ll look into doing this as well because I have just stalked all the links and priced it and sent this post to my ski loving boyfriend haha. AMAZING! Thanks so munch for the inspo. 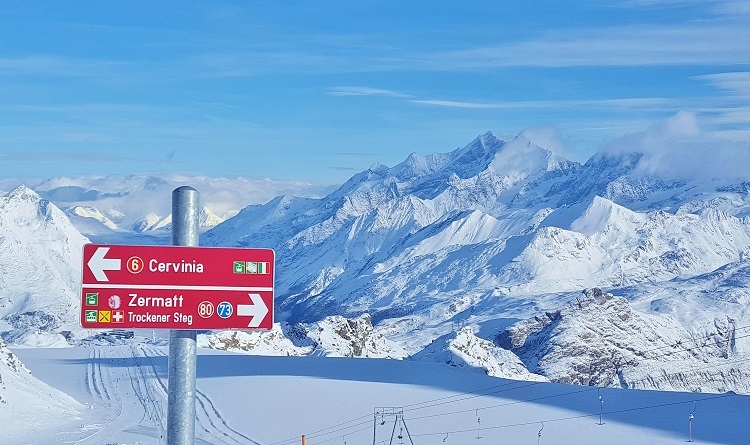 Milian is just over a 2hr drive to Cervinia (but Turin in only an 1hr and half) and if you are going to Zermatt get the skipass that covers you for both areas. You know you can ski in Zermatt/Italy late May on the glaciers? 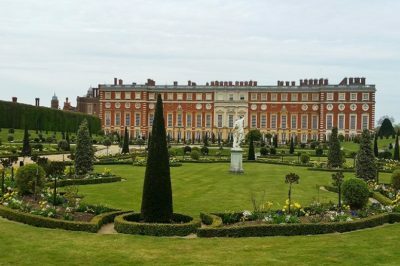 Not going to lie – this was not high on my list of places to visit. However, seeing it from Italy and the cute little town and skiing, I am intrigued. I don’t even ski – but now I want to give it a go. Italian Winter Wonderland 😍 I wish I was there, even though I’m a terrible skier. I’d probably spend more time in the lodge than the slopes, but that view though… Amazing! You don’t have to ski to go here, lots of people come to enjoy the views, Matterhorn, food and wine 🙂 It is definitely worth a visit. Matterhorn was on my bucket list as my best friend lives very nearby, but I had no idea about all of the offerings on the Italian side. I haven’t yet been to Italy, and I am planning an epic tour of the country, eventually. I’m not much of a skier, but I love the views, hot chocolates, good food, and spas! Lots of people go there to enjoy the views and to enjoy the good wine and food. I highly recommend it, as it is only 2hrs from Milan. Looks like a dream ski vacation, and the mountain looks so much different from Italy! I wonder how long the ski season lasts? It has one of the longest ski seasons in Europe. You are right it is beautiful on both sides of the mountain and the best bit is your ski pass will allow you to enjoy both sides. We were in Zermatt this past summer and saw the Matterhorn in all it’s glory then. Loved the vibe and the entire region and while I was aware that part of it is in Italy as well, and we took a gondola to the Italian side, I wasn’t aware of the resort. I don’t ski, but even then I think this is a region that can be appreciated by everyone for its majestic beauty. For Skiers though, you are right, i’m sure it is a thrilling experience. Thanks and hopefully next time we stay on the Italian side. 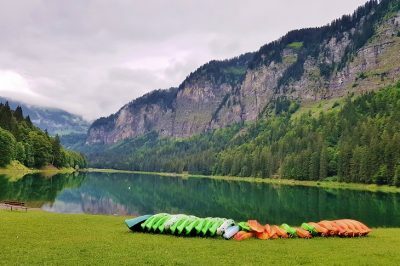 The resort is opened all year around and they have some amazing hikes and activities during the summer. You can even ski on the glaciers on the boarders during the summer too. Let me know if you ever go and I will happily point you in the right direction. Wow Melissa, it is so so so beautiful! The views from up there are breathtaking! I love the Alps but I’ve only been in the summer, never seen them covered in snow. I have friends who went to the Mattherhorn though, for a ski trip, and they highly recommended it! lol, I bought some Toblerone yesterday for my husband. 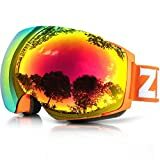 I have skied in Zermatt as well and it is just as beautiful but expensive. I have seen pictures of Cervinia in the summer and it looks amazing. I definitely want to go back in the summer to do some hiking. I think this is the first time I’ve read about the Italian side! What a fun adventure. The kids have not been skiing yet and we always travel with them. I had one – terrifying experience skiing when I was a kid so I haven’t been keen on going back…even to give them the experience. I like to encourage people to step outside their comfort zone….perhaps I should take my own advice on that and take the kids skiing! 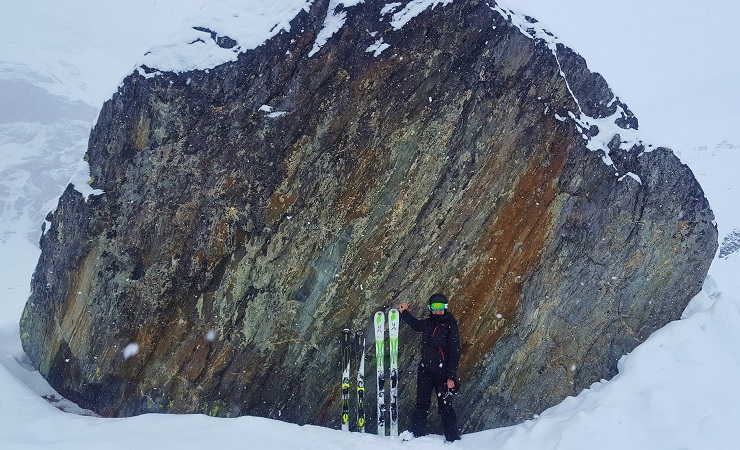 This is a great place to learn how to ski as a lot of the runs are wide and in gullies, so I think it makes you feel a lot safer. They also have child proof locks on some of the chairlift which i think is a great idea. I love that first picture and the way it appears with the light on it at night. I have visited the Swiss side of the Matterhorn so maybe whilst living in Northern Italian this year I can explore this side. Definitely, take a trip there especially if yo are living in Italian. They drive to the mountains from Turin airport were really stunning as well as, you pass by castles. Ah I was in that part of Italy (Milan and the area) just a month ago, and did not get to go skiing – I’m so jealous looking at these pictures! 😀 It looks like a perfect weekend in the mountains. That Chalet Etoile got me intrigued – if skiers from Zermatt go there, it must be worth the hype haha! Looks like you had a great time! Milan is only a 2hr drive away, so very close. We fly into Turin which is just over an hours drive, you are correct it is a great place to go if you want to ski for a weekend. Oh my … the pic of the mountain at night is stunning! I don’t know skiing … I want to learn it. I am planning to join a course in India in Dec and then head to Europe next year. Will bookmark this post for my reference when I plan the trip! Wow, what an amazing scenary! 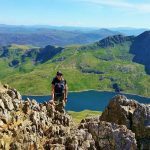 Your pictures are really beautiful and this must have been such a great experience! I haven’t skied for over 20 years. In fact the last time I went I was 7 1/2 months pregnant with my youngest son much to my husbands dismay lol. I used to go all the time I just can’t cope with the cold anymore. My boys and hubs living boarding and I know they would love this. I on the other hand could enjoy the apres ski in the bar! It looks so cute and cosy and I love that’s it’s family run. I concur lovely and it is definitely one of my favorite places to visit. Wow, it’s amazing photos. I didn’t know Matterhorn is the border between Italy and Switzerland. I found your blog while I was looking for the way from Chamonix to Matterhorn by a car next week. 🙂 We don’t plan to ski but want to see Matterhorn. Thank you so much for sharing your experience. How was driving to Breuil-Cervinia? Glad you come across and thank you in regards to my photos. You can actually ski up until late May if you like 🙂 The drive was easy and picturesquely, you pass a couple of castles and forts. Also you will go through a couple of tolls, we used coins but I think you can use credit cards too. I hope that helps.